The Generator Connection Cabinet (also known as a “tap box” or “docking station”) provides a quick and convenient station to connect a portable generator to a facility’s electrical power distribution system. Whether during a long-term utility outage or a planned facility maintenance period, our cabinet will help you easily and safely establish a connection to temporary back-up power when time is of the utmost importance. 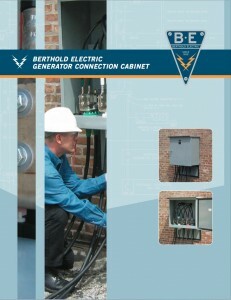 Originally developed in 1968, the Generator Connection Cabinet’s design has been advanced and refined for safety and ease of use as a result of consultation with consulting engineers, installers, and end users.